We begin the tour with our two founders, Rich White and Mike Schwartz, and Bob Fasano, who made it all happen. 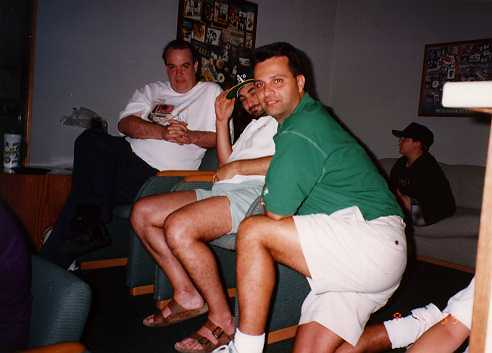 This picture was taken at an Oakland Athletics game (whom we host on commerce) in (I think) late 95 or early 96. Here are what we refer to as The Four Horsepeople. 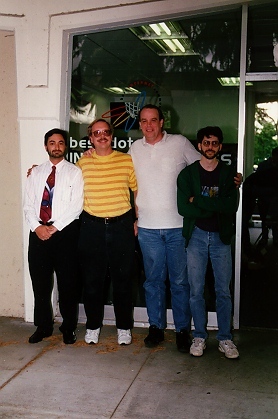 From left to right: Mike Schwartz (Founder), Bill Ladwig (Telecom/POPs), Rich White (Founder/CTO), and Matt Dillon (Royal Smart Person). This picture was taken in front of our storefront about a year ago. 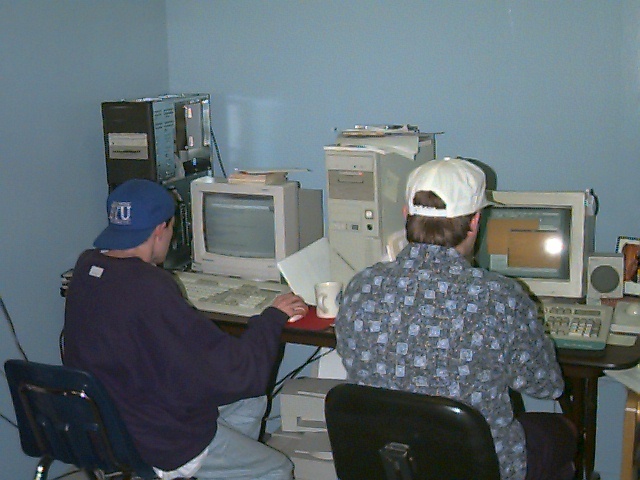 Here are two of Best's biggest geeks: Don MacAskill and Bryan Woodworth. Don is logged into the famous sanctuary.best.com, which used to live in the closet next to this office. We used to speculate that it trafficed more W4r3z than all of usenet's warez groups, but we can't confirm or deny that rumor. Some customers used to complain about packet loss across our ethernet from 9pm to 2am every night for a few months while Best was still on Castro. Amazingly enough, this coincided with the nightly Doom games at Best. Next to Don is the original HostHamster. This phrase was coined by Shawna Herrick when she told a customer that he must email the hosthamster for further help with his domain. She meant hostmaster. Really. You can see Bryan logged into Rich White's PC. This PC is responsible for several thousand accounts being created and printed from it. Some nights Rich, Bryan, and Sam would create hundreds of accounts. Now, keep in mind, this was before web pages and automatic account creation. Everything was done by hand. At some point, Matt created an automatic account creator, called Best-Adduser (when you type it on the unix prompt it's badduser) However, the account creators still had to cut and paste all the information to the Word documents that were printed out and faxed to customers. Typically, we were several dozen to several hundred accounts behind due to the demand.